A roadside stand may be just a table on the lawn, where surplus garden products can "be displayed for sale from time to time. It may be a more permanent stand in front of the home or on a nearby highway, with a display counter or shelves, and a roof to protect the produce and the attendant from both sun and rain. It may be still more ambitious, a fairly large structure where several farm families cooperate to sell most of their fruit and vegetables and other products to steady customers and passing motorists who like to buy direct from the growers to get freshness and high quality. Stands which show up well from either direction on the highway, so motorists may see them in time to slow down, apparently have an advantage. A place to enable customers to park comfortably and safely is an essential. Location on a heavily traveled route seems not so important if one has developed customers for a specialty, Signs will direct people down a side road to find this specialty. 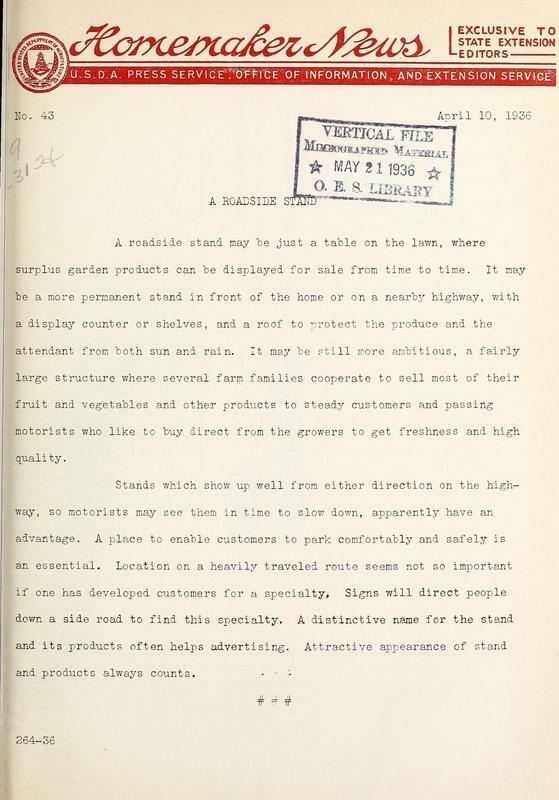 A distinctive name for the stand and its products often helps advertising. Attractive appearance of stand and products always counts.